The histories and registers of the Inspirationist Awakening list the names of Gemeinde members who were called by God to serve as Werkzeuge. They came from different walks of life, fulfilled their role as Werkzeuge for different lengths of time (some served for a lifetime, others for just a matter of days or months), and had unique personal histories — but each one contributed in his or her way to the awakening, establishment, and continuation of the Wahren Inspirierten. A Werkzeug is a person, in a state of inspiration, through whom God sends His message to His people. Zeugnisse usually are delivered orally (Aussprache) through a Werkzeug and recorded by a scribe. 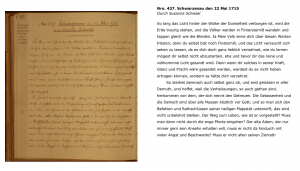 Occasionally a Werkzeug will deliver a Zeugnis himself or herself in written form (Einsprache), although this became more prevalent in the 19th Century. 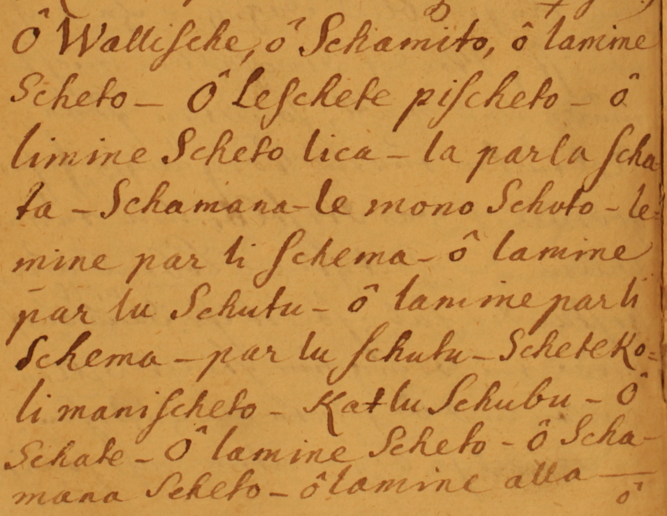 Depending on the circumstances, a Zeugnis consists of just a handful of pointed words, or, it can continue for many minutes and fill many manuscript pages. Some Werkzeuge used gestures and body language to further illustrate a message. And we are told that most Werkzeuge spoke slowly and rhythmically, enunciating each syllable of God’s Word. Humans do not become Werkzeuge by their own volition. Rather, they are chosen by God. And once chosen, even the most reluctant Werkzeug cannot but fulfill his/her assigned role as a conduit for delivering the divine Word. Werkzeuge serve the Gemeinde (Community) for varying lengths of time, from just a few days or months to many decades — all depending on God’s will. Zeugnisse are often, but not always, preceded in a Werkzeug by involuntary internal and external movements, called Bewegungen. These Bewegungen rise out of a profound internal stillness, and can range from subtle feelings of warmth and intense spiritual joy all the way to vigorous physical agitations and ecstatic shouts. A Werkzeug experiencing Bewegungen is literally being moved by the Spirit. There is no single answer to the question of “how many Werkzeuge were there?” We have four histories written by Inspirationists that list the Werkzeuge of the Awakening years (1714-1749). This table compares the Werkzeuge named in each history. Werkzeuge are listed chronologically, by date of earliest testimony. Eleven Werkzeuge appear in all lists: A.F. Pott, J.T. Pott, J.H. Pott, Johanna Melchior, Eva Wagner, J.A. Gruber, J.R. Rock, Johann Schwanfelder, B.D. Mackinet, Ursula Mayer, and J.C. Gleim. One Werkzeug, Christina Kratzer, appears in three of the four lists. Five Werkzeuge appear only in the Haupt=Register: A.M. Hag, Susanna Schissel, Samuel Richter, Marie Bärbel, and Friedrich Ulick. Of this group, four delivered just one Zeugnis each, and Richter delivered four. As explained in Kurze Historie II, maybe the best answer to the question of how many Werkzeuge there were, is the simplest answer: there were always the right number of Werkzeuge. Whenever the Lord in His wisdom foresaw that this or that Werkzeug was growing weary of the struggle and ready to give up the fight, there already were others being divinely prepared to step in right away and fill the gap by becoming a Werkzeug and continuing God’s Work. Wann je der HErr nach seiner Weisheit voraus sehe=daß dieses oder jenes Werckzeug wancken=müde werden=und den Kampf aufgeben würde, so waren schon wieder andere in der Göttlichen Bearbeitung, um dadurch sie sogleich wiederum die Lücke auszufüllen, die Stelle zu ersetzen, und GOttes Werck fortzuführen. The spiritual path that the early Inspirationists were required to walk was narrow, steep, and slippery. The path was strewn with stumbling blocks: physical (temptations of the flesh), spiritual (false prophets), and intellectual (the subtle serpent of reason). The standards for the personal lives of the Werkzeuge — for those Inspirationists chosen by God as the passive instruments through which He delivered His Word — were high. The lives of some Werkzeuge are well documented through biographical and autobiographical sources (Zeugnisse, diaries, histories, Letzte Stunden (thanatographies) and other Inspirationist documents). About other Werkzeuge we today know little; sometimes we have only a Zeugnis or two, prefaced by brief contextual remarks. The focus of this page is on those pivotal moments in an Inspirationist’s life when he or she crosses a threshold, either to receiving the Gift of Inspiration and becoming a Werkzeug, or to losing that Gift. But even Werkzeuge who had lost the Gift of Inspiration were not depicted solely as failures. Instead, their stories of all-too-human weaknesses were recorded as illustrative lessons for other Inspirationists. And in most cases, even the most fallen of Werkzeuge were presented an opportunity to return to the path. In secondary literature the three Brothers Pott often are treated almost as a single “unit,” such that what applies to one, applies to all. While they do share a common familial and spiritual background, they each contributed in different ways to the Inspirationist Awakening, and each has his own personal history. The three brothers (in a family of three daughters and eight sons — four of whom had the first name Johann) were born in Halberstadt (where the Pietist thought of Spener was well received), and between 1707 and 1712 all three eventually ended up at the university in Halle (another center of Pietism), where they studied jurisprudence, theology, and medicine. There also is a strong possibility that as early as 1711 the Potts were exposed to the Camisard Prophets (sometimes called French Inspirés) who had stays in Halberstadt and Halle (among many other places) during their extended journey through Europe. While the full extent of the role that the Camisard Prophets played in the Inspirationist Awakening is still to be discovered (and is beyond the scope of this project), there are significant similarities in thought and action between the Camisard Prophets and the early Inspirationists. For example, inspired individuals (instruments/Werkzeuge) in both groups experienced involuntary movements (agitations/Bewegungen) and delivered inspired testimonies (prophéties/Zeugnisse) that were recorded by scribes and almost immediately published. Cri d’Alarme (1712); German translation Alarm-Geschrey (1712). Quand Vous Aurez Saccagé, Vous Serez Saccagés (1714); German translation Wenn Ihr Werdet Verwüstet Haben, So Werdet Ihr Verwüstet Werden (1717). Plan de la Justice (1714); German translation Grundriss und Entwurf der Gerechtigkeit (1717). We know that the Brothers Pott and E.L. Gruber were familiar with Alarm-Geschrey. When the Potts first arrived in Hanau, Gruber asked them a very specific question about Alarm-Geschrey (whether the source of inspiration could be an angel instead of God himself?). And there are partial copies of both a printed and a handwritten version of Alarm-Geschrey in the Archive. In addition, a bound volume, containing both Wenn Ihr Werdet Verwüstet Haben, So Werdet Ihr Verwüstet Werden, and Grundriss und Entwurf der Gerechtigkeit is found in the Amana Heritage Society Library. At one time this volume belonged to 19th Century Werkzeug Christian Metz, who wrote an inscription inside the front cover, which begins: Dieses Buch gehört Christian Metz. Wer lesets, der gebe es zu rechter Zeit wieder… [This book belongs to Christian Metz. Whoever reads it, should return it promptly...Arnsburg, 21 December, 1834]. All of this is strong evidence that the Inspirationists were well aware of the Camisard Prophets and had read their inspired testimonies. 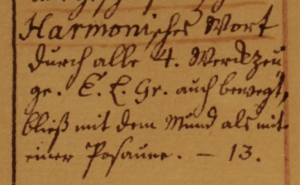 From an old manuscript: As the Holland Inspirerds were expelled from Halle, they spent the night in a bakery in Passendorf, and the young student August Pott was anointed by divine authority as an apostle through a laying on of hands and divine breath through Buro and the other Holland Werkzeuge. Pott immediately received a divine order to travel, and this promise occurred during the departure. Aus alten Papieren: Als die Holländische Inspirirte aus Halle ausgewiesen, übernachteten sie im Backhause zu Passendorf, und August Pott, ein Junger Student wurde zum Apostel gesalbet von dergött[lichen] Kraft durch Handauflegen, und das gött[liche] Anblasen von Gott durch Buro und die andern Hölländ[ischen] Werkzeuge. Er bekam auch gleich Befehl zur Reise, wo bei der Abreise, diese Verheißung geschahe. A.F. Pott, the youngest of the three Brothers Pott, delivered sixteen Zeugnisse during September and October 1714, after which he lost the gift. After leaving the Inspirationist Gemeinde in 1715, he returned to his medical studies in Halle and graduated in 1720. He then served many years as a country doctor in Lower Saxony. J.T. Pott (1691-1759) was the eldest of the Pott brothers. He studied medicine in Halle, and he received the gift of Inspiration in 1714, at the age of 23. From October 1714 through February 1715, he delivered forty-two Zeugnisse. His final two Zeugnisse deserve mention here. On 21 February Pott delivered a public Zeugnis in Marienborn against Count Carl August von Ysingen-Büdingen. The Zeugnis also stated that Pott and J.A. Gruber were to take a copy of the Zeugnis to the Graf himself. In response, the Count decreed that Pott must leave the county within 24 hours, and that if Gruber did not remain silent, he, too, would be forced to leave. A cry in the morning, a cry in the evening, a cry at noon, a cry at midnight arrives so suddenly. Wail and cry, you people in the cities, in the countryside, in the villages! A devastation is coming, a total destruction of you all, a cataclysm delivered by an all-powerful God. Ein Geschrei von Morgen, ein Geschrei von Abend, ein Geschrei von Mittag, ein Geschrei von Mitternacht kommt plötzlich daher. Heulet und schreiet, ihr Einwohner der Städte und der Flekken und der Dörfer! Denn es kommt eine Verwüstung, eine Verstörung über euch alle, eine Verheerung von dem allmächtigen Gott. This would be his final Zeugnis. On that same day, 23 February 1715, J.T. Pott left the Inspirationist Gemeinde. He returned to his hometown of Halberstadt. Shortly thereafter he married the (former) Werkzeug Johanna Margaretha Melchior, who too had left the Gemeinde on 23 February. On 26 June 1715, Werkzeuge J.A. Gruber and Eva Catharina Wagner traveled to Halberstadt, where they met with Pott and Melchior. Gruber delivered a succinct Zeugnis. Is it opportune for you to journey yet today? And I need to ask, where are you headed? Are you going to the right or to the left, forwards or backwards? I really want to see where you are inclined to go. Make a choice; you will not be impeded. Nevertheless I shall act according to My pure will, and if I see that your wants are in harmony with my hidden counsel, I will allow you to do as you wish. But if not, I shall demonstrate My will to you. Now, there are four ways for you to go. Choose one! *NB. 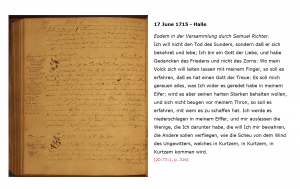 Gruber writes that on that same day, 26 June, they went to Pott’s house. Gruber came into Inspiration: he stood up resolutely and walked around, then he swayed back and forth, and finally fell to the ground. First came an Inspired Word addressed to the entire household, and then an Inspired Word directed at J.T Pott and Johanna Melchior. At the beginning they [Pott and Melchior] took it quite well. For several weeks they had experienced no Bewegungen, but that evening they were moved by the Spirit and the entire household was bathed in such extraordinary energy, causing several people in the house to offer inspired prayers. But by the next morning, 27 June, everything had changed. Tobias [J.T. Pott] had filled the hearts of Melchior and the others with negativity and hostility. These two [Pott and Melchior] caused us great distress and discomfort. There then occurred many Zeugnisse for the blessing of the others. Aber ihr, ist es euch gelegen, Heute nocht zu reysen? Und wohin wolt ihr, muß Ich fragen einmahl, zur Rechten oder zur Lincken, vor sich oder zurück? Ich will doch euch gerne einmahl sehen, wohin ihr incliniert: Wahlet einmal, es soll euch nicht verwehret seyn: Ich will dennoch thun nach meinem lautern Willen, und wann Ich sehe, daß euer Wille harmoniret nach meinem geheimen Rathschluss will Ich euch solchen zugeben, wo aber nicht, will Ich euch meinen Willen anzeigen. Nun es sind euch Vier Seiten Vorgeschlagen. Wahlet eine! N.B. * Gruber schreibt, daß sie selbigen Tag, den 26ten Juni, in Potten Haus gegangen. Gruber musste in Inspiration erstlich mit Tapferkeit stehen und gehen, sodann wancken, zurück gehen und fallen. Es geschahe ein Wort übers gantze Haus. Hernach ein Wort an Joh Tobias Pott und Joh Marg Melchiorin. Sie nahmen es anfangs wohl auf, und da sie etliche Wochen keine Bewegungen gehabt, bekahmen sie den Abend, und das gantze Haus wurde mit einer besonderen Kraft überschüttet, so daß welche in Inspiration bethen musten; Aber den 27ten Morgens war alles anders, und Tobias hatte der Melchior und Aller Hertzen gegen uns angefült mit Widrigkeit, und machten diese Beyde, Mann und Weib, uns viel Leyden. Es geschahen viel Bezeugungen zu anderer Seegen. In later life J.T. Pott became a Schichtmeister (shift manager at a mine or iron works) in a small town in Lower Saxony. J.H. Pott (1692-1777) was the middle Pott brother. Although he never delivered a Zeugnis, he is considered a Werkzeug by all four Inspirationist histories. Presumably this is based on an Inspired prayer that he delivered in Hanau on 13 November 1714, immediately following an A.F. Pott testimony. After that, the middle Pott brother was moved by the Spirit of prayer. Because all the words he spoke were accompanied by such spiritual power, they immediately kindled feelings in us of faith and love. This convinced us of the new and gave us certainty that this was the Work of the Lord, for He alone can reveal the hidden counsel of the heart. J.H. Pott left the Inspirationists in Spring 1715. In 1719 J.F. Rock visited Pott in Halle and spoke with him about his former and his current spiritual state, during which Pott …admitted that he was no longer as blessed and empowered as previously. They [Rock and colleagues] gave him a sincere admonition, which he accepted with humility. In later years J.H. Pott would become a Professor of Chemistry in Berlin. Behold, I come to you too! You shall become My child, and no longer a child of the world or of the flesh. Instead, you shall be a child of the living God, who shares great goods with his children and equips them with great abilities. Behold, you shall not be taken from me again. I will prepare you to be an attentive and pleasing Werkzeug! The world shall no longer have any power over you; rather it will repulse you. You shall despise it all. It will be like filth and muck to you. But you shall love Me above all else and worship Me as the God of all gods. And you shall find yourself in My Holiness! For I have chosen you as My bride, and your bridegroom will never leave you, but will hold you in His bosom and embrace you with loving arms. You will be infused with the powers that will keep you Mine and enable you to achieve that which I want you to achieve! Siehe / Ich komme auch zu dir! Du solt mein Kind werden / und nicht mehr der Welt / noch des Fleisches / sondern ein Kind des lebendigen GOttes seyn / der seinen Kindern grosse Güter kan mittheilen / und sie ausrüsten mit grossen Gaben. Siehe / du solt mir nicht wieder geraubet werden! Ich will dich zubereiten zu einem mir gefälligen Werckzeuge! Die Welt soll dir nichts mehr anhaben können / sondern solt ihr ganz zuwider werden! Du solt alles anspeyen; vor Koth und Dreck solt du alles halten! Mich aber solt du über alles lieben und anbeten den GOtt aller Götter / und in seinem Heiligthum erfunden werden! Denn Ich habe dich zu meiner Braut erwählet / und dein Bräutigam wird dich nicht verlassen / sondern wird dich in seinen Schooß nehmen / und dich mit Armen der Liebe drücken / und einflösen diejenige Kräffte / die dir nöthig seyn werden / daß du mein bleibest / und aurichtest / was Ich von dir wil gethan und ausgerichtet haben! I soon will open the mouths of several more who shall speak through My prophetic Spirit, for I am already preparing them. Ich werde bald noch Einigen mehr den Mund aufthun, durch Meinen prophetischen Geist zu reden, denn Ich habe sie jetzt in der Zubereitung. Within the coming weeks this prophecy was fulfilled, as Johan Adam Gruber, Johann Friedrich Rock, and Johann Melchior Schwanfelder all would receive the gift of Inspiration. Melchior left the Gemeinde on 23 February 1715, the same day that Werkzeug Johann Tobias Pott left. The two would be married shortly thereafter. The gift of prophesy [came to] Eva Catherine Wagner, born in Reichen (Saxony), resident of the Ronneburg, and wife of Michael Wagner. She walked in this narrow spiritual path for 14 months, from October 1714 until January 1716. She made several different journeys — to the Zweibrücken area, to Nurnberg, Halle, Berlin, Magdebury and Braunschweig — in the company of her husband, J.A. Gruber, and Mackinet. Already in October 1714 she was moved to repentance through the Potts at the Ronneburg and through Melchiorin, when she received God’s call: “She shall be God’s messenger, who He will send forth in His service.” Before this time she had not experienced a spiritual awakening, although her husband had. Wagner delivered 131 Zeugnisse in her fourteen months as a Werkzeug. Her final Zeugnis occured on 6 January 1716 in Berlin. After losing her Gift of Inspiration, Wagner and her husband remained in the Gemeinde. Five months later, in May of that year, a Zeugnis through Ursula Mayer was directed at Wagner, providing some insight as to why Wagner lost the gift of the Word. Listen well, My maidservant! You have not guarded with a pure heart the Word I entrusted to you. You have not allowed My helpful chastening mercy to bear fruit within you. You have not resisted your human emotions, although I certainly have given you the power and strength to do so. I have therefore been compelled to withdraw My Word from you. And I will not give it back to you so quickly. To be sure I will soon heal you and begin anew your spiritual cleansing. If you listen more attentively to My chastening mercy, I again will allow my merciful influence to enter within you. Look inward and examine your innermost depths, so that I might make something substantial out of you. Höre du, Meine Magd! du hast das dir=vertrauete Wort nicht in einem reinen Hertzen bewahret; du hast Meine heylsame züchtigende Gnade oft unfruchtbar in dir seyn lassen; du hast deinen natürlichen Affecten nicht widerstanden, worzu Ich dir doch Kraft und Stärcke genug dargereichet hätte. Deroweg Ich gezwungen worden Mein Wort wiederum von dir hinweg zu nehmen. Ich werde es auch dir so balde nicht wiedergeben. Ich werde dich zwar bald gesund machen, und von neuen an deiner Reinigung arbeite. Wirst du nun Meiner züchtigenden Gnade besser gehör geben, so werde Ich Meine Gnaden-Einflüsse wiederum in dich einfliessen lassen. Kehre in dich, und grabe in deine Tieffen, damit Ich aus dir etwas Wesentliches hervorbringen könne. Anne Marie Hag joined the Inspirationists shortly after the Awakening in 1714, and she delivered a single Zeugnis, on 30 November 1714 in Bergheim. Little else is known about her personal life, other than that she apparently embodied a spiritual temptation for two Werkzeuge, Johann Friedrich Rock and Johann Melchior Schwanfelder. As described further below for Schwanfelder, Hag is blamed for his spiritual downfall by means of her “seductive power” (Macht der Versuchung). Rock, too, writes of the effect that Hag’s presence exerted on him, referring to it as “love sorcery” (Liebes Magie). In an extended passage in his autobiography, the Humble Path of a Sinner on Earth (Erniedriungs=Lauff eines Sünders auf Erden), Rock begins by telling of receiving a inner Divine Word that he should make a missionary journey to Württemberg along with Ursula Meyer. He admits that although he always feels Angst traveling in the company of women, he would do so because it was God’s Will. Mayer, however, already had left on a journey with Br. Jäger. Then Schwanfelder arrived and informed Rock that a Zeugnis in Eschborn had commanded him [Rock] to go on a journey, and that Schwanfelder and Hag would accompany him. Already on our departure I sensed Hag’s penetrating presence, which frightened me. I urgently prayed to the Lord that He shield my heart and that my heart may be open to Him alone. The true God did so devotedly, and even if on this journey I was among serpents and basilisks [a mythical poisonous reptile], they would not poison me…. I once again felt her presence pressing in on me; it was such powerful love sorcery [Liebes=Magie] that I could barely keep my heart closed to it. Just then a verse came to mind: “To none other will I agree, my heart to open other than Thee.” We soon made our way back home. My JEsus in His beneficent Mercy had protected me and delivered me from this brood of serpents. Hallelujah! Ich fühlte mich einsmahls wiederum ihr in=mich=dringen recht starck, und war solche Liebes=Magie, daß ich fast mein Hertz nicht konte davor verschlossen halten, alsbald fiel mir der Vers ins Gemüth: Keinem andern sage ich zu, daß ich ihm mein Hertz aufthu, etc. …Darauf reyßten wir bald nach Hauß, und mein JEsus hat mich aus lauter Gnaden bewahret, und von dieser Schlangen=Brut erlöset, etc. Hallelu-Jah! Anne Marie Hag and Johann Schwanfelder left the Inspirationist Gemeinde, were married soon thereafter and moved to Berlin, where they were still living in the 1740s. Rock’s autobiography The Humble Way. Johann Schwanfelder, a swordsmith by trade, was a member of the Stuttgarter Separatisten (a radical Pietist group) until 1710. He joined the Inspirationists in late 1714. Although he was a Werkzeug for just three months, at least 190 Zeugnisse were delivered through him, including 98 in February 1715 alone. His intense activity was even noted in the Haupt=Register by such comments as “eight Zeugnisse,” “14 Zeugnisse today,” etc. To be sure some of the Zeugnisse were short — maybe just a few words — but others were multiple pages long. Several of the Zeugnisse delivered through Schwanfelder are singled out in Inspirationist histories as being particularly notable. One time in Düdelsheim as he was delivering a Zeugnis to a large throng of people, Schwanfelder turned to a man who was cursing him and said that the Lord wished to speak to him “in a thunderous voice.” Soon thereafter a thunderbolt struck the curser’s house. In another case, after a threatening word was delivered to a man through Schwanfelder, the man met a sudden end: one morning when the man awoke and wanted to smoke his pipe, he sent his wife into the kitchen to fetch a hot coal to light the tobacco, but when she returned to the room, the man was dead. Als er einst zu Düdelsheim unter grossem Zulauf des Volks aussprach, wandte er sich in der Bewegung zu einem Flucher und sprach, der HErr wolle mit einer Donnerstimme zu ihm reden. Bald darauf schlug der Donner und Blitz in sein Haus. An einen Andern erging ein Drohungswort durch ihn, der starb bald darauf plötzlich. Morgens beim Aufstehen wollte er eine Pfeife Taback rauchen, schickte seine Frau in die Küche eine Kohle zu holen und als sie wieder in die Stube kam, war er todt. 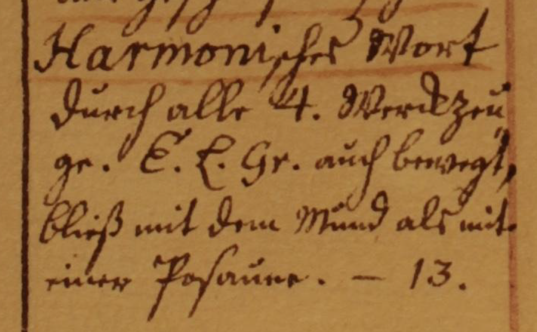 Schwanfelder’s last recorded Zeugnis was delivered on 11 March 1715 in Eschborn. The next month, on 18 April 1715, Schwanfelder, Anne Marie Hag, and Johann Friedrich Rock left on a journey that would take them through Württemburg. This journey would be the occasion of Schwanfelder’s spiritual downfall. According to Inspirationist histories, Schwanfelder’s downfall was attributed to the “seductive power” of Anne Marie Hag. [During] Schwanfelder’s journey to Friedberg, Butzbach, Wetzler, Herborn, und Schwarzenau, he was faced with several tests in this “prophets’ school” that would enable him to prove himself — but he instead allowed Hag to steal his heart and seduce him into the ways of the flesh. Schwanfelder that eine Reyse nach Friedberg, Butzbach, Wetzler, Herborn und Schwarzenau: Er solte nun durch Proben mancher Arten sich bewähren lassen in dieser Propheten=Schule, ließ sich aber durch die Hagin das Herz stehlen, und ins Fleisch verführen. After leaving the Inspirationists, Schwanfelder and Hag moved to Berlin, where they were still residing in the 1740s. My son’s Bewegungen became more frequent, and occur now daily, during which, however, he himself remains passive. His Bewegungen, his vigorous quakings, begin and end with an ardent and wondrous invocation of the name of Jesus. Until now he has not articulated any inspired pronouncements, except for an occasional word or two. But he does make certain animated gestures that mimic truly lifelike battle or combat action. Sometimes he takes on the form of a victorious lion, who fights against certain regions of the world. Other times he enacts a battle, fought mornings, midnight, and evenings, that always ends with him falling to the ground as if dead. He also portrays divine judgments, not to mention many other thought-provoking and inspiring scenes, whose meanings we must leave to the Lord’s wisdom. Finally on 28 January 1715, a Zeugnis through Johanna Melchior in Büdingen proclaimed that Gleim soon would receive the Gift of Inspiration. Behold, thus speaks the Lord your God: My servant Carl [Johann Carl Gleim], soon I shall open your mouth and place within it My Inspired Word. My strength will fill you. My true and pure strength, and my true and pure Word, shall flow through you, My servant. I will make you into a forceful hero, so that I can accomplish many great things through you. Siehet, also spricht der HErr dein Gott, Mein Knecht Carl, (Gleim) Ich werde dir bald deinen Mund öffnen, und das Wort Meines Lebenden Geistes in dich legen. Meine Kraft soll dich ganz durchdringen, Meine reine lautere Kraft, und Mein reines lauteres Wort will Ich durch dich Meinen Knecht fließen lassen. Ich werde dich machen zu einem starken Helden, damit Ich viele und große Dinge durch dich ausrichten kann. His first recorded Zeugnis was delivered on 3 February 1715 in Büdingen. During Gleim’s thirty-six months as a Werkzeug, more than five hundred Zeugnisse were delivered through him, including one hundred and twenty seven published in Geschrey zur Mitternacht (1715). He [Gleim] and J.A. Gruber withdrew from the strict spiritual examination of E.L. Gruber (the overseer of the Prophet Children) and from the Gemeinde, and lost the gift of inspiration at the end of 1717. Dieser [Gleim] und J.A. 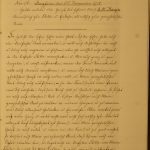 Gruber entzogen sich der ernsten Prüfung E.L. Grubers, des Aufsehers der Propheten=Kinder, und der Gemeinde, und hörten auf zu sprechen mit dem End des Jahrs 1717. After leaving the Gemeinde, Gleim apparently had little contact with the Inspirationists. A terse entry in Haupt=Register for 7 February 1718 states: Conflict with J.C. Gleim [Kampf mit J.C. Gleim]. 1.) Whether he [Gleim] does not acknowledge his fall and apostasy. In his former role as God’s trumpet he awakened the clever and foolish virgins at midnight by sounding the alarm. Since then, however, a tobacco pipe has replaced the trumpet in his mouth, and it blows only foul-smelling smoke. Note the allusions to the published volume of Gleim’s Zeugnisse, titled Geschrey zur Mitternacht [Cry/Alarm at Midnight]. 1.) Ob er [Gleim] nicht seinen schweren Fall und Abfall erkenne, da er vormalen als eine Posaune Gottes, die klugen und thörichten Jungfraunen zu Mitternacht erwecket, und Alarm geblasen; nachhero aber, die Tabacks=Pfeife anstatt der Posaune uns Maul genommen und einen stinkenden Dampf aufgeblasen. J.C. Gleim moved to Germantown, Pennsylvania in the 1750s, where he died in 1770. Susanna Schissel delivered one Zeugnis, on 22 May 1715, in Schwarzenau. The testimony was addressed primarily to young women. 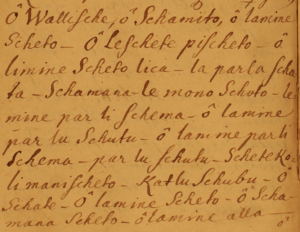 Samuel Richter delivered four Zeugnisse in summer/fall 1715. All in Halle. 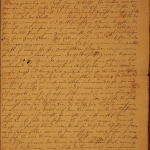 His first recorded testimony, on June 17, 1715, is shown below. The testimony urgently warns of the impending apocalypse, which will come very soon (de[r] Wind des Ungewitters, welches in Kurztem, Kurtzem, Kurtzem kommen wird). Richter is greatly fallen spiritually and has even spoken maliciously about Br. Rock. Already here he appears insufficiently awakened, either in the Spirit or to God. Richter ist sehr verfallen und gegen Br. Rock gar gelästert und scheint hier schon nicht auf den Geist genug gewecket zu haben, oder zu Gott. 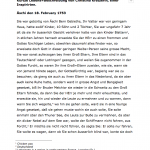 Richter reappears four years later in Inspirationist writings, in the introductory comments to a 2 August 1719 Rock Zeugnis in Halle, where we are told that Samuel Richter and his wife recently arrived in Halle from Schwarzenau in the company of false prophets, notably Maria Elizabeth Mathis. 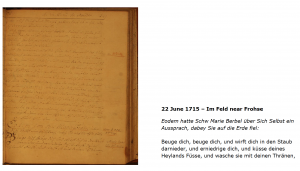 Marie Bärbel (or Berbel) delivered one Zeugnis, on 22 June 1715, in a field near the town of Frohse. This testimony, in which she prostrates herself on the ground, is addressed to her self (über sich selbst), and admonishes her to acknowledge her misdeeds and return to the ways of the Lord. Bärbel was traveling in the company of the two Werkzeuge J.A. Gruber and E.C. Wagner, both of whom themselves addressed testimonies to her. Here is Eva Catherina Wagner’s immediate response to Bärbel’s testimony, in which she tells Bärbel that experience will show whether she has been seduced by the Spirit, or by the evil ways of the flesh. 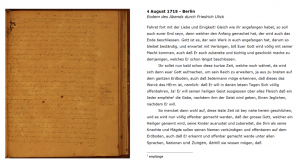 There is one recorded Zeugnis from Friedrich Ulich, delivered on 4 August 1715 in Berlin. The testimony is an emphatic warning that the “end times” are approaching, which will destroy the earth but also usher in the new Millenium. The language is full of apocalyptic imagery and terms: the end is near; the destruction of the world will also be its beginning; the bridegroom is coming soon; in these last hours, etc. [Das Ende ist nahe; ..de[r] Ausgang dieser Welt…wird wiederum seinen Anfang nehmen; der Bräutigam wird bald kommen; in dieser letzten Stunden, etc.]. Christina Kratzer (1696-1733), also known as das blinde Stinele (blind Tina), was a Swiss-born Werkzeug who delivered twenty Zeugnisse from 1727 to 1730. Kratzer’s Lebenslauf, written in 1753 by Hans Kratzer (likely one of her ten brothers), is included below. On July 28, 1716, during a joint Zeugnis (harmonischer Wort) in Büdingen, delivered by the four Werkzeuge J.A. Gruber, Gleim, Rock, and Mayer, E.L. Gruber was moved to purse his lips and blow like he was playing a trumpet. Harmonischer Wort durch all 4. Werkzeuge. E.L. Gr. auch bewegt, bliess mit dem Mund als mit einer Posaune.